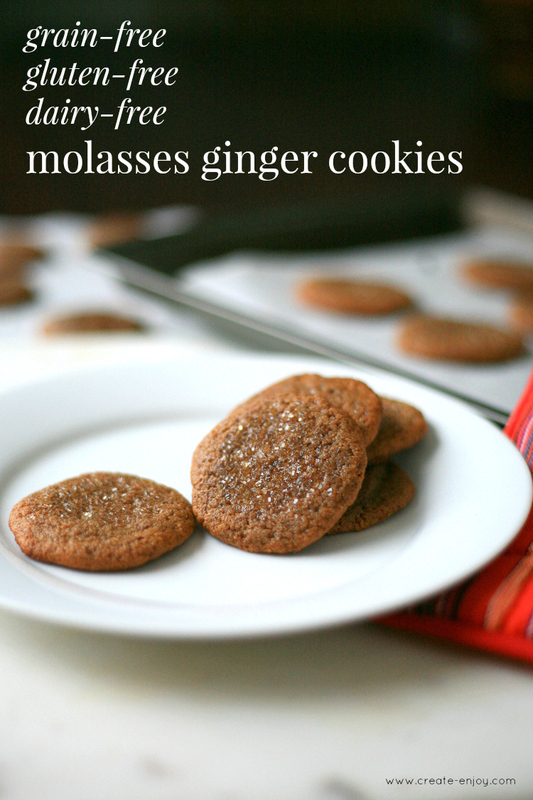 Health(IER) holiday treat: molasses ginger cookies, a grain-free version of an old tradition! And free groceries from Whole Foods! Flash back to the holiday season, 2006. I was on the treadmill at the University of Oregon gym reading a Cooking Light magazine. (2006 Suzannah thought a low fat vegetarian diet and lots of steady-state cardio were healthy, and that she could eat all the sugar she wanted, just not too much butter.) I found a molasses cookie recipe with crackled sugar on top that sounded yummy, and tore the page out for my recipe binder! (Pre-Pinterest.) I made that recipe every holiday season for several years! A lot has changed since then! 2016 Suzannah is physically and emotionally healthier and knows so much more about herself and her body, and doesn't crave sugar or overdo it on treats. BUT, turns out I still love the taste of these holiday ginger-ey cookies!! So, for this recipe today I literally flipped back through that old recipe binder and pulled out that ancient magazine page, and modified this recipe to use grain-free, gluten-free flours and natural sweeteners! Plus, I teamed with Whole Foods Market on this post and you can enter for a chance to win free groceries for a year with them, the #MyHolidayTradish sweepstakes! These cookies were a tradition for me for several years, so I'm excited to be able to make them again (and husband remembers them from those days, too!). Yay, holidays. These cookies are still no health food, and are very sweet, but they are gluten-free, grain-free, dairy-free, and Paleo-friendly, so I can eat them without feeling like crap afterwards! A much better choice than a lot of the holiday treats I'm surrounded by this time of year. The original recipe used white sugar for the tops, but I used raw, organic, non-GMO sugar on these so it looks like sprinkles! Molasses was a staple in my mom's pantry, and I had it even in my pared-down college student kitchen. Now, I know the importance of using non-GMO ingredients, and I found this organic, non-GMO one at Whole Foods. 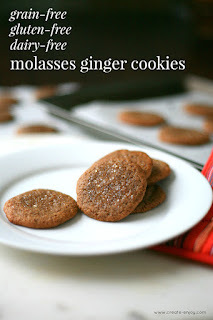 These delectable cookies have a strong molasses flavor plus the yummy spices of a ginger snap. 1. Combine sugar and oil in a bowl or electric mixer bowl. Beat with electric mixer until light and fluffy. Add molasses and egg; beat well. 2. In another bowl, combine all dry ingredients except raw sugar. Mix well. 3. Combine flour mixture with liquid mixture. Freeze for 1 hour. 6. Bake for 7-8 minutes; allow to cool. These guys are SO good!! They're not crispy like a ginger snap, but are soft and chewy, and almost spicy with the holiday spices! Making these brought back memories of college and my early holidays living on my own. The strong, sweet smell of the dough, the way my hands get sticky rolling the balls, the fun texture of the crispy sugar on top... Husband and I are both really excited to have this tradition to enjoy again! Don't forget to enter here for a chance to win groceries for a year in the #MyHolidayTradish sweeps from Whole Foods! Thanks to Whole Foods Market for providing me with the ingredients for these cookies!